The Ethics Of Traveling To Nicaragua: Should I Go? As Nicaragua celebrates her independence this weekend, we look at how much there is to actually celebrate, given the current crisis. We also look at the ethics of traveling to Nicaragua at this time. Five months have passed since Nicaragua turned upside down, but it feels like five years. I can only imagine how it feels for those inside the country. A lifetime, I’m sure. 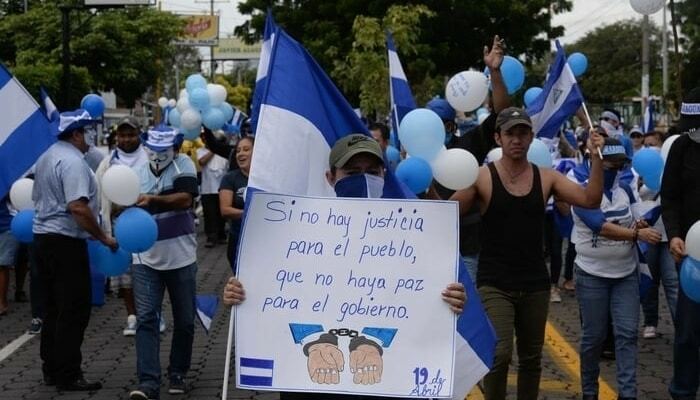 For those of you who live under a rock – or receive your news from the mainstream media who’ve done a remarkable job of not covering this situation – Nicaragua has been in a state of crisis since April when Daniel Ortega started killing his own citizens for having the nerve to protest against his regime. April, May, June, and July were the peak terror months. Over 400 people died during that time, with many more injured and missing. By mid-July, the superior brute strength of Ortega’s paramilitaries prevailed. The barricades were down and the people cowed into – if not submission – a bitter, fearful silence. After the killing came another form of repression. Ortega passed laws labeling protesters, and those who aided them as “terrorists”. Sending money or gifts to people who had protested is aiding and abetting terrorism. So is assisting injured protesters in hospitals and clinics. Doctors and nurses are losing their jobs or being arrested for exactly this. All these “crimes” are punishable by years in prison and the government are picking people up. Last week Ortega asked Costa Rica to return refugees (“terrorists”) whose names were on his hit list. People are still going missing. Mothers still wait outside the infamous El Chipote Prison with photos of their children detained inside. Hilux pickups still prowl the streets. Masked men strut and swagger in the back like German soldiers riding around occupied Paris during WWII. Nicaragua has been invaded and occupied by its own government and its army of Cuban and Venezuelan mercenaries. The atmosphere is tense, subdued. People are afraid to talk, afraid to write, except under a false name unless they’ve left the country. And thousands have left the country, at least 20,000 to Costa Rica alone. Despite what you might hear, things are far from normal in Nicaragua and might never be normal again. At least not while Ortega stays. Which brings me back around to the perennial question of traveling to Nicaragua. Should you right now? It’s a burning question with valid arguments on both sides. There is so much wrong with this sentence I don’t even know where to start. Should I start with the use of the word “incidents” instead of, say, repression? Murder? State-sponsored terror? “Incidents” has a nice, neutral ring to it, granted. Like how the Nazis called the gas chambers “badeanstalten” (bathhouses). Or should I start with “fairly isolated”? If an “incident” isn’t happening much, so what? I mean I’m sure more people get killed in Detroit every day, right? What about “out of the tourist line of vision”? These seven words might piss me off most of all. “Out of the tourist line of vision”. Think about that for a second. Could they be the most self-centered, first-world-problemish, selfish, most ignorant seven words you’ve ever read, considering the context? I mean the government might shoot people and burn babies, but since tourists on Omepete can’t see it, no importa. Hey, I can drink Toñas and surf all day and not worry about those pesky locals getting slaughtered down the road. I can Sunday Funday like a rockstar safe knowing El Chipote is miles away. Those mothers waiting for news of their children won’t cut my buzz. So why on earth should someone even consider traveling to Nicaragua as a tourist in times like these? It’s a question I ask every day. As shocking as the sentence discussed above is, I don’t believe the Canadian tourist wrote it to be malicious. She’s naïve, not bad. She doesn’t know what she’s talking about, that’s all. But naivety like this is dangerous and plays into the hands of Ortega, who wants to pretend all is normal again. I’m sorry though, until he’s gone, things won’t ever be normal. This is why my opinion is that tourists should avoid Nicaragua until that day arrives. Tourism also means acceptance. This is why the boycott of South Africa during the 80s was so effective. Same with Myanmar in the 90s and 2000s. If you’re outraged at a government’s behavior enough to boycott that country, you’re throwing shade at it, embarrassing it, letting it know it’s not accepted. Daniel Ortega’s government needs to be ostracized, to know it’s not accepted in a civilized world. I’m not naïve enough to believe Ortega cares about acceptance, though. The US, the EU, the OAS, the UN, and others have all denounced him. Pretty much everybody has, except for the Russians, Venezuelans, and Cubans. More important than acceptance, tourists mean money. Money to the government who uses it to finance its repression. Cuban mercenaries don’t come for free. You might not realize you’re financing Ortega by staying in hostels and eating in local restaurants, but you are. You’re financing Ortega the moment you pay your entry tax at the airport or the border. And Ortega loves money. He loves your money (and your acceptance too, but most of all your money). There’s another argument, one I have a lot of sympathy with. I worked in Nicaraguan tourism for a long time, so I have sympathy for the jobs lost and the hotels closed. I get the argument that states you should go to Nicaragua to support the people, not the government. But I only get it to a degree. Supporting the people means getting rid of Ortega and replacing him with someone who doesn’t rig elections and shoot you. It’s about playing the long game. Going back to normal and a flourishing tourist economy only serves to keep Ortega in for longer. Outside the political situation, Nicaragua is captivating. It’s always been cheap to visit, but now it’s cheaper than ever as those hotels, hostels, and resorts still open drop their rates to attract visitors. Social media is full of hotel owners telling people how safe Nicaragua is again. But safety isn’t the point for me. San Juan del Sur and Ometepe have always been safe. The violence never reached those places. But money spent in those places will trickle up into Ortega’s coffers. Even if it’s a penny in the dollar that goes his way, that’s a penny that helps keep him in power for another day, week, month, year. Ultra-cheap prices, empty waves, magnificent beaches. This is Nicaragua nowadays. But behind the paradise, there’s a lot of pain and if you visit, please know you might contribute to prolonging that pain. I don’t say outright to NOT visit Nicaragua. That’s a decision only you can make. But I believe visiting a free Nicaragua, a Nicaragua in charge of its own destiny and not in the hands of a tin-pot dictator will make your experience far richer. And both you and Nicaragua deserve that.